Super Mario Land 2: 6 Golden Coins is a platforming game for the Game Boy released in 1992 and later for the Nintendo 3DS's Virtual Console in 2011. It is the sequel to Super Mario Land and also marks the debut of Wario, who would later become a recurring character in the Mario series as well as a protagonist in his own series. Like its predecessor, it received a Player's Choice and was produced by the late Gunpei Yokoi rather than the Mario series creator Shigeru Miyamoto, who was not involved in the development of this game. It is notable for having been the last side-scrolling Mario game until 2006's New Super Mario Bros., 13½ years later (discounting re-releases & remakes). Like Super Mario Land, this game was originally excluded from the main Super Mario series by Nintendo, but were included alongside the more traditional games for the 30th anniversary of Super Mario Bros., and the history page from the Mario Portal and "The official home for Mario" websites. While I was away crusading against the mystery alien Tatanga in Sarasa Land, an evil creep took over my castle and put the people of Mario Land under his control with a magic spell. The intruder goes by the name of Wario. He has been jealous of my popularity ever since we were boys, and has tried to steal my castle many times. It seems he has succeeded this time. Wario has scattered the 6 Golden Coins from my castle all over Mario Land. These Golden Coins are guarded by those under Wario's spell. Without these coins, we can't get into the castle to deal with Wario. We must collect the 6 coins, attack Wario in the castle, and save everybody! IT'S TIME TO SET OUT ON OUR MISSION!! ★The 6 Golden Coins are the coins needed to open the gate of Mario's castle. The plot, which immediately follows that of the first game, consists of Mario returning to his castle after rescuing Princess Daisy, only to find that it has been taken over by an old enemy, Wario, while Mario was in Sarasaland. The 6 Golden Coins (Mario's keys to the castle) were spread throughout Mario Land, and Mario must retrieve these coins in order to defeat Wario, reclaim his castle, and restore order to Mario Land. The Tree Zone: A large tree infested with giant insects, this zone is guarded by the Bird. The Space Zone: Encompassing the moon and stars, this zone is guarded by the alien Tatanga, the final boss of the original Super Mario Land. The Macro Zone: A house-like zone that shrinks those who enter it, this zone is guarded by the Sewer Rat. The Pumpkin Zone: Located inside a giant jack o' lantern containing graveyards and haunted houses, this zone is guarded by the Witch. The Mario Zone: A mechanical version of Mario, this zone is guarded by the Three Little Pigheads. The Turtle Zone: Inside of a giant turtle, this zone is an aquatic environment and is guarded by the Octopus located inside of a Whale. Mario's castle: After gathering the six golden coins, Mario can venture into a dangerous, transformed version of his old castle, Wario is waiting at the end. In addition to the tutorial level, there is also another level that is not part of any specific "zone" or area, and lies off the path between the Tree Zone and the Macro Zone. Playing this level does not unlock anything, though does count as one of the exits in the game. Unlike the tutorial level, this level can be replayed. With Wario as the antagonist, this is the third Super Mario title to feature a major villain that is not Bowser, the first being Super Mario Bros. 2's Wart, and the second being Super Mario Land's Tatanga. Gameplay screenshot of the tutorial level. Unlike the gameplay of its predecessor, Super Mario Land 2's gameplay more closely resembles that of past Mario franchise titles. Most notably, this game replaces the Superball Mario with a more traditional Fire Mario and does away with Super Mario Land's vehicle levels. The screen can now scroll to the left, allowing Mario to backtrack through levels, and character sprites have significantly increased in size, enabling more focused and fast-paced action as well as a better overall visual quality to the game. The game is one of the first Mario games to have two different difficulty levels: Normal and Easy mode. The level can be chosen by picking Mario's size with the button before picking which file to save to. Like in Super Mario World, the game's locations can be traversed via an overworld map. This gives rise to a few secrets, including "shortcuts," which allow Mario to traverse the map more quickly, and a casino where Mario can gamble his coins to earn more lives. Unlike those of Super Mario World and the earlier Super Mario Bros. games, Super Mario Land 2's worlds do not have to be played linearly without requiring a hidden item or exit, although all worlds must still be cleared. The player can return to the world map from a completed level by pressing to pause and then . In levels, the allows Mario to jump, while holding the will make Mario run faster. Holding up on the will make Mario jump a little higher. The controls where Mario walks or runs. The player can pause in a level with the button. Jumping on most enemies will defeat them, as will attacking them with fireballs, a Star, or hitting them with a Koopa Shell. A Koopa Shell can be picked up by running into it while holding and thrown by letting go, or it can be kicked by walking into it or jumping on top of it. Super Mario Land 2 continues a tradition established by past games and includes a plethora of level designs. For example, there are water levels through which Mario swims by tapping (Mario can also swim through sap, and movements such as walking and falling are slowed down) and space levels with altered gravity (jump height is increased, as is fall time). Mario can use Warp Pipes in the same manner as in other games: by holding down on the while standing on top of one, up while jumping up into one above, or left or right for pipes that are horizontal. Getting hit by an enemy or hazard while Mario is in his Small state, falling to the bottom of the screen or in lava, getting crushed behind the screen in an auto-scrolling level, or running out of time, makes Mario lose a life and get booted out of the level and back to the map. If Mario loses all of his lives, he will also lose all of the six coins he has collected and will have to fight their guardians once again, but he does not have to replay the other levels in their worlds to get there. Extra lives are represented as hearts as opposed to green mushrooms in this game, due to the grayscale graphics. Each level has a checkpoint, which is a bell hanging from a block. If Mario rings the bell, he starts the level from this location should he lose a life. The exits of regular levels are marked "GOAL" and consist of a door in the wall and a bell hanging from a post above it. If Mario enters the door, the level immediately ends, and he returns to the map and progresses to the next stage marker, but if he hits the bell first, he gets to play a bonus game which can reward him with power-ups or more lives. Collecting 100 coins does not immediately reward Mario with an extra life like it does in other titles, but it does allow the player to enter the casino in the hill between Mario's castle and the tutorial level for a chance to earn lives. Mario can hold up to 999 coins. There is no "score" in the traditional sense that Mario gets in this game for defeating enemies or completing the level with extra time, but he does have an enemy counter for each enemy he defeats, and defeating 100 enemies will cause a star to fall down to Mario. Bunny Mario, a new ability introduced in the game. The Mushroom grows Mario into Super Mario, which allows Mario to take a hit without dying (reverting him to regular Mario) and gives him the ability to break Brick Blocks by jumping underneath them, like in previous titles, but it also allows him to perform a Spin Jump to break Brick Blocks beneath him by pressing down on the in midair, a technique taken from Super Mario World. Super Mario can destroy Koopas, Koopa Shells and some multiple-hit enemies by landing on them with it, but other than that, the Spin Jump does not have quite the same effect that it does in Super Mario World, but it will function the same way as a normal jump when Mario lands on other enemies or hazards with it. The Fire Flower performs its usual ability, allowing Mario to shoot fireballs by hitting that bounce along the ground as a weapon, but Mario can now also use them to break a special kind of block as well. Fire Mario is recognizable by a single feather in the front of his cap in this game instead of a change in color, perhaps due to the Game Boy's limitations. 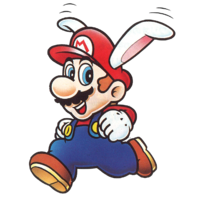 The introduction of the new Carrot transforms Mario into Bunny Mario. This gives him the ability to flap his bunny ears and hover by tapping the button, giving him the ability to stay in the air longer and cross or maneuver around obstacles and hazards with greater ease. The Star turns Mario invincible, protecting him from harm, but instead of the power-up moving like it does in other titles, it will stay still on the ? Block. The fifth enemy killed while invincible and every enemy afterwards until Mario reverts to normal gives Mario an extra life. As the game's title suggests, the game is split into six different worlds, and then a final level where Mario fights Wario, the final boss. Marches back and forth in a small area, damaging Mario if touched. Moves like a Goomba and propels Mario high into the air when stomped. Jumps into the air, and flies downwards at an angle. Flies away when Mario gets close. Rolls on top of a Beach Ball, which can be used to traverse spiky and dangerous floors. Stays still, damaging Mario with its tongue. Can be used as a platform. Emerges from honeycombs, trying to home in on Mario to sting him. Periodically fires Bullet Bills at Mario. Swims aimlessly in one direction, while occasionally pausing. Patrols an area, occasionally shooting cannonballs horizontally or diagonally. Chases Mario whenever he's not facing it, but hides when he is. Hops a small distance before lashing out its tongue for a short-ranged attack. Dug up by Goronto, and rolled towards Mario. Drops down to crush Mario, then flies back to its position. A bullet that is periodically fired out of Bill Blasters. Fired from Bomubomu either horizontally or diagonally. Swims back and forth in the water. Has retractable spikes that can damage Mario if he tries to jump on it. Ants with cannons on their heads that periodically fire pellets. Flies forwards in a straight line. Hovers around in a figure-eight area. Falls from the ceiling to hit Mario. Fire large, horizontal fireballs at Mario. Bounces around diagonally in small rooms. Moves back and forth in a pendulum-like swing to damage Mario. Smaller than Furizō. Moves back and forth in a pendulum-like swing to damage Mario. Larger than Furiko. A replica of Wario's fist that crashes down at great speed. Walks forwards aimlessly, can be defeated with one stomp. Digs up rocks and rolls them towards Mario. A spiky Unera that can't be jumped on. Swims underwater in an upside-down V-shape. Emerges from ? Blocks, then hops around wildly. Hops into the air, before opening up and floating down, while moving side-to-side. Four spinning pillars that come crashing down from the sky before rising back up. Runs away carrying a 1 UP Heart. Charges at Mario at high speeds, usually in groups. Can be knocked into its shell, which can be kicked to hurt other enemies. Stays in place, sending small bats called Minikyura after Mario. Waits for Mario to appear before charging at him. Flies in quick, darting motions to home in on Mario. Walks forwards aimlessly, propels Mario upwards when stomped. Small bats fired at Mario by Kurokyura. Swims in sap, and charges at Mario horizontally if he gets close. Emerges from the ground, and bounces towards Mario. Jumps around, and fires arcing, exploding stars. Patrols an area, and explodes after being stomped. Hops around in a small area, having their wings removed with one stomp. Hops back and forth in a small area. Periodically emerges from pipes to bite Mario. Orbits blocks or areas of empty space. Burrows underground to pop up and damage Mario. Bounces back and forth as it sweeps the ground. Spins around a point slowly to damage Mario if touched. Swims slowly in the water, but charges when Mario gets close. A variant of Bībī that can come back to life when stomped. A hedgehog that curls up into a ball and dashes at Mario. Occasionally puffs up to float upwards underwater. Floats in space, and can not be defeated by any means. Egg-like enemies that emerge from small, plant-like pods and move upwards. Sawblades that move horizontally on a set path. Moves like a Goomba, but can not be defeated with a stomp. Hops out of the water, and glides on the air for a brief period of time. Moves along a vertical, chained path to damage Mario, pausing briefly before changing directions. Inflates briefly to block Mario's path. Crawls slowly while patrolling an area. Indestructible enemies found in air and water. Periodically emerges from pipes, and shoots a fireball. Sawblades in the ground that move back and forth. Spinning blades that move along tracks. 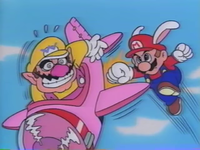 Mario battling Wario, from the Japanese video based on the game. An educational Japanese-only video, called Mario Kirby Meisaku Video, was produced in 1995 based on the game. It featured a segment based off Super Mario Land 2, and another one featuring Kirby and other characters from his series. The video follows an alternative version of the game's plot, where Wario steals treasures from a school, and after being informed by Princess Peach, Mario embarks on a mission to defeat Wario. The intent of the videos was to teach Japanese children Kanji. After the introduction of Wario (who quickly became popular) the Super Mario Land series shifted its attention to him. The next game, Wario Land: Super Mario Land 3, featured Wario as the protagonist, with Mario only making a minor cameo at the very end of the game. The next game in the series was simply titled Wario Land II, thus making Wario Land the final entry in the Super Mario Land series. Although this game marked the first appearance of Wario, dialogue in the instruction booklet suggested that Wario was an old enemy of Mario who was jealous of his fame and fortune. In the comic book inspired by this game, Mario vs. Wario, Wario was said to have been one of Mario's friends when they were both children. However, because of the numerous indignities Mario (unknowingly) forced Wario to suffer, Wario swore revenge on him (which led to the events of both Super Mario Land and Super Mario Land 2: Six Golden Coins). Super Mario Bros. – After Mario defeats Wario, the ending cutscene reads "Thank you, Mario. Your quest is over." Princess Peach says this after Mario defeats Bowser in Super Mario Bros.
Super Mario Bros. 3 – The music for Water Land can be heard in the background of the music for the Mario Zone and stage 3 of Tree Zone. Super Mario Land – The direct predecessor of this game. It is revealed that Wario stole Mario's castle during Mario's rescue of Princess Daisy. Tatanga is seen working for him in the Space Zone, implying a connection between the two. Super Mario World – Super Mario's sprite in this game is heavily based off of of his Super Mario World sprite. Blurps return here, alongside enemies inspired by the Monty Mole and Fish Bone, while Cheep Cheeps use a design inspired from their appearance in this game. Also, the spin jump returns. Mario's Tennis: Mario's sprite in the character selection looks almost exactly like his sprite from this game, only in a tennis outfit. Luigi's sprite in the character selection also looks noticeably similar. Super Smash Bros.: One of Mario's alternate costumes is based on Wario's outfit. Wario World – The castle shown on the title graphic bears a striking resemblance to Mario's castle. Mario & Luigi: Superstar Saga – The battle start sound is the same as the power up emerging from a ? Block sound in this game. Paper Mario: Sticker Star – The Space Zone level theme is remixed when the Boom Box Thing is used. Fortune Street – Wario has a quote where he says that if he flips the "M" upside down it will be his. Super Mario 3D World – Bowser uses a Super Bell and Double Cherries in the same way Wario used a Carrot and a Fire Flower in his battle with Mario. Development for Super Mario Land 2: Six Golden Coins began in November 1991, and took ten months to complete. In a 1992 interview, the game's director and designer Hiroji Kiyotake discussed that the team originally wanted to divert from the conventional ideas established by past Mario games. Pursuing this concept, the initial work on the game lead to the first draft being turned down, due to disagreements on whether the product properly represented Mario's character and the in-game world he is reknowned for. Realizing that they were on the wrong path, the team reworked it to "something a little closer to the existing Mario world". However, the team still desired to provide Mario with a new objective, rather than fighting to rescue the princess as seen in most Mario games leading up to that time. The game's staff wanted a "change of pace", and decided that Mario should fight to win back something that belongs to him, rather than fighting for "someone else's benefit". Various members of development staff, who were a part of the interview published in the game's official Shogakukan guide. 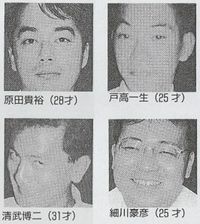 Clockwise from the top-left: Takahiro Harada, Kazumi Totaka, Takehiko Hosokawa and Hiroji Kiyotake, with their respective ages at the time. Wario, as depicted being sketched by a gloved hand. The glove shows a "K", which presumably signifies Hiroji Kiyotake. It was Kiyotake's idea to introduce Wario as a new character, with whom he discussed it with the assistant character designer Takehiko Hosokawa, before presenting the idea to the rest of the game's staff. Before Wario's actual character development, his name was the first thing that was decided on. It was derived from the Japanese word "warui", meaning "bad". The idea to have an upside-down "M" on his cap (representing a "W") received immediate, enthusiastic support by the rest of the development staff. Wario's character was based on the idea that a protagonist should have an arch-rival and nemesis. Kiyotake compared Mario and Wario to comic book characters Popeye and Bluto's relationship, where Bluto is larger, stronger and more cunning than his counterpart, and normally motivated by self-interests. After the idea of Wario was agreed on by the rest of the staff, Kiyotake discussed the details of in-game sprite animation and movement with programmer Takahiro Harada. As well as Wario, there were many other characters which was proposed by Kiyotake. Many of these were either direct rejects, or characters that did not gain approval from the wider staff team. Kiyotake was very fond of the untouchable Bē enemies used in Tree and Macro Zones, even causing him to "burst out laughing" after he first interacted with them after they were programmed. He was eager to see the Bē remain in the final game, as he was amused by how it would likely annoy players. While developing the controls for the game, Harada considered that players may find it difficult to hold down two buttons on the Game Boy's D-pad to move in a diagonal direction. This was kept in mind while programming how Mario's Bunny and Spacesuit performed high jumps. Kazumi Totaka, who composed the music for Super Mario Land 2: 6 Golden Coins, acknowledged that the sound effect played when transforming into Super Mario was originally identical to the one used for Super Mario World until about midway through development. However, he was afraid that the player would be given an impression that they are playing a game that overlaps with Super Mario World, and become "negatively conscious" that they were playing on a small Game Boy screen compared to the television screen used by the Super Nintendo Entertainment System. Therefore, Totaka chose to use many different sound effects across other past Mario games. Asides from composing, Totaka also had a partial role in some of the discussions between Kiyotake, Harada and Hosokawa. Totaka was able to provide comments and feedback while proposed ideas were being evaluated. He was also able to come up with suggestions of his own, although these were mostly rejected. According to Takahiro Harada, the most challenging stage of development was adjusting and fine-tuning the test version after it was presented to beta testers. As he and the team had been playing and testing the gameplay since the beginning, they initially believed that the beta version was too easy. However, Harada stated that the testers generally found the game very difficult. About 2-3 months was spent on making small changes to the test stages, according to the feedback which they received from the beta testers. Nintendo 3DS Corbie Dillard, Nintendo Life 9/10 "The original Super Mario Land was a solid start for the series on Nintendo's Game Boy system, but nothing could prepare gamers for what the developers were able to do with this sequel. They managed to improve every aspect of the game and even made the adventure a much longer and more rewarding experience this time around. The difficulty is perhaps a bit on the easy side, but it's still one of the best Game Boy titles ever released and a testament to just how capable a game system the Game Boy truly was, and still is for that matter. If you're a Super Mario fan with a 3DS, you absolutely must take the opportunity to own this game; if you're not, this legendary release is good enough to make you one." Nintendo 3DS Shane Jury, Cubed3 8/10 "Easily one of the early highlights for the 3DS eShop, Super Mario Land 2: 6 Golden Coins brings a pure platforming experience to handheld owners, together with some unique attributes for the game to call its own. Length and toughness issues aside, Mario’s second portable endeavour and Wario’s introduction is simply a must play." A pre-release screenshot and a video showed that there was a different, less detailed title screen in at least one build. The original title screen. This can be seen in a Game Boy commercial. The music for this game was composed by Kazumi Totaka. If the player waits on the Game Over screen for two minutes and thirty seconds, Totaka's Song will play. For this subject's image gallery, see Gallery:Super Mario Land 2: 6 Golden Coins. If the player loses a life in a level they have already completed, it is possible to exit the level by pressing + (even when the death animation is playing, if done fast enough) without losing any lives. On the File Select screen, if the player is deleting a file, Mario will transform into Bomb Mario. This page was last edited on April 21, 2019, at 00:38.